In this chapter three prominent philosophical issues in relation to the nature, aims and values of education that seem to have an impact on faith-based schooling in the modern era are examined. 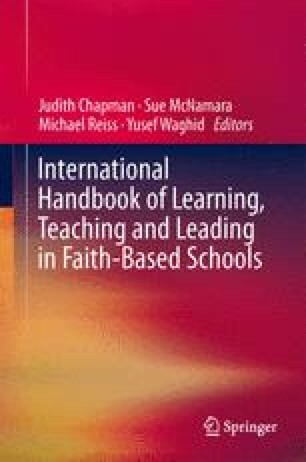 I propose firstly, that faith-based education aims to inculcate in learners a sense of autonomy; secondly, that faith-based education aims to cultivate the notion of a common humanity; and thirdly, that faith-based schools are confronted by a culture of authenticity in which every individual chooses his or her own way of realising his or her humanity. In relation to the aforementioned issues, I firstly, expound on faith-based education in some liberal societies, with the intention of pointing out how the notions of autonomy, common humanity and authenticity seem to have impacted on thinking about faith-based schooling. Secondly, I examine how autonomous, humane and authentic action under the guise of democratic citizenship education can be cultivated, especially in the Arab and Muslim world where such a form of education seems to be constrained. Instead, I make a defence for a pedagogy of disruption that can hopefully advance autonomous, humane and authentic action in faith-based schools.